Fukumoto Fuku was featured in many places before the Mizen Gallery of Art featured her pieces in person. At one point they had a feature written up on her in Ceramics: Art and Perception, which is an honor in its own right. 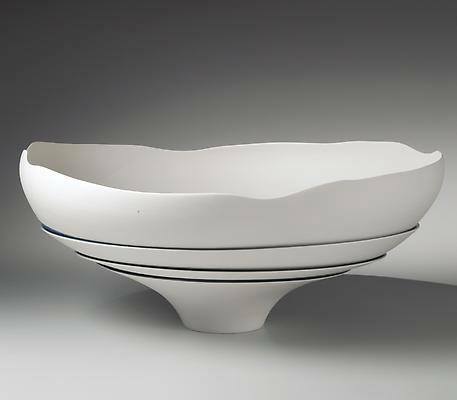 Ms. Fukumoto remarked that the use of both exterior white glaze and interior blue glaze in her bowls allows the creation of a visual device that fills two voids. The blue and green areas juxtaposed with the white become a sort of metaphor for air and the Earth itself. 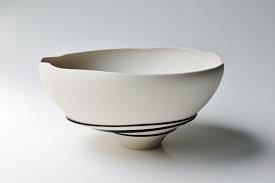 Ms. Fukumoto’s elegant minimalism has been all over the world, like this piece in the Metropolitan Museum of Art. Each of the ripples in the rim creates a visual vibration that occurs between these two voids. Overall the effect mimics what one might see if they were to take a look at a horizon that’s blurred by some distance and take a closer look at what happens to one’s vision when gazing on this sort of thing. This sort of thing gives Fukumoto’s ceramics work a decidedly contemplative appearance. Some art appreciators have gone so far as to suggest that gazing on the gentle curves of some of her pieces has a meditative quality to it. Astronomy is of course very important to her designs, and some people have used the term lunar work to describe what she’s doing with her Japanese ceramic pieces. While they have a certain natural quality to them that’s reminiscent of flowers, they also do resemble the moon. Of course, it’s important to keep in mind that the moon is a natural object as well. Keiko Art International put this particular piece by Fukimoto on display. Interestingly her motions and the medium itself have a lot to do with the finished product as well. Her forms arise from the way that claw reacts during the throwing process. She lets herself discover entirely new techniques organically as she goes along, allowing the clay to teach her as much as anything. Fukumoto-sensei’s ceramics pieces aren’t on display merely in France, japan and the United States, however, though she did have pieces that traveled throughout the US and the rest of the world between 2007-2012. She also has had a number of pieces by private collectors, who have actively sought out her designs. Nevertheless, these kinds of statistics say nothing about the art itself. Those who want to get a better idea of what her works are all about certainly need to take a closer look at these pieces and make their discoveries as organic as she makes the creation of them.